Remove the front seat. Refer to “exterior parts removal and installation” in section 9d (page 9d- 6). 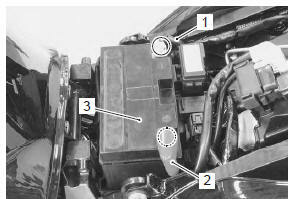 Disconnect the battery (–) lead wire (1). Disconnect the battery (+) lead wire (2). be sure to disconnect the battery (–) lead wire (1) first, then disconnect the battery (+) lead wire (2). Remove the battery (3) from the motorcycle. Install the battery in the reverse order of removal. never use anything except the specified battery. Tighten the battery lead wire bolts securely.